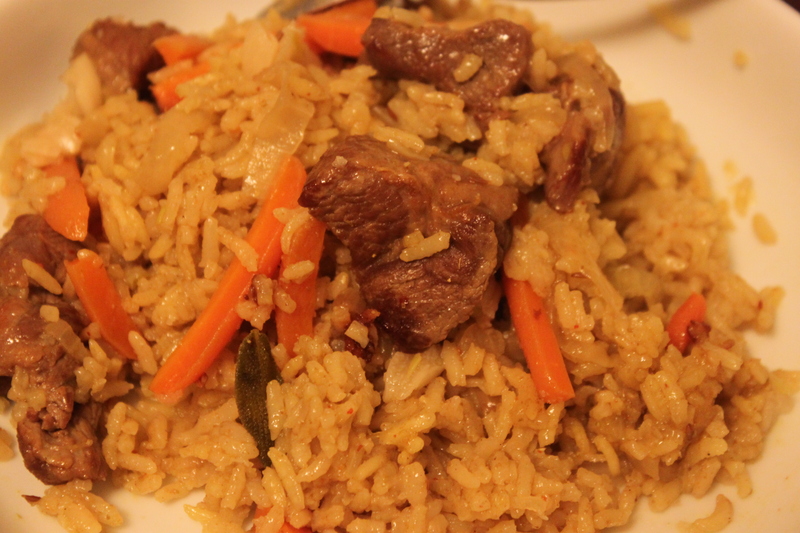 Plov is a very famous traditional rice dish of Uzbekistan. Loosely speaking, if Indian has Biriyani, Italian has Risotto, Uzbek Plov can be called the sibling of the other two. Who says food has no relatives? My sister in law has spent almost 12 years living in Russia where she learnt a lot of Russian staples and other Russia’s surrounding’s as well. She cooked Plov many times and my husband once was lucky to eat. He said that Plov is delicious but has more fat than any Biriyani or Risotto does. Yes, he’s right. Biriyani has least fat because it uses only several tablespoons of cooking oil for a huge stock pot of rice. Risotto is fatter than Biriyani with the main reason is the butter added to the rice at the end of the cooking process and the fat from Italian sausages. So what about Plov? Uzbeks use fat reserved from lamb to cook this dish. Don’t blame them on this unhealthy cooking style. Russian or other vicinities’ peoples has to live in the extremely extreme cold weather, thus surviving there requires people to have lots of energy. The following picture shows you how much water should be added to make sure your rice can “drink” enough water to be cooked but still be ensured no sloppiness. This is the only trick to cook this dish, otherwise, you are the host of this dish. – 1/4 cup cooking oil. If you have lamb fat, use it to have more original version. – This technique would help the rice from being sticked to one another when you cook. – Add 1/4 cooking oil in a deep and wide mouth pan, like a wok. Use medium high heat to heat the oil until it’s hot then add in the lamb. Sprinkle some salt ( 1/4 tsp) and stir fry it until the lamb chunks are brown. Remove from the pan. – Reduce heat to medium. Add the cumin seed in the reserving oil and fry until it’s aromatic for 20 – 30 seconds. Add the chopped onion in and stir fry until it’s brown for 3 minutes. – Add in the julienne carrots and stir fry for 2 minutes. Sprinkle 1/4 tsp salt and add in cumin and coriander powder, tarragon and barberries (if you have). – Add in 2 tsp – 3 tsp salt to the stock or salt to your taste. You should taste the salty of Plov at this time or you no longer have a chance to taste it later. 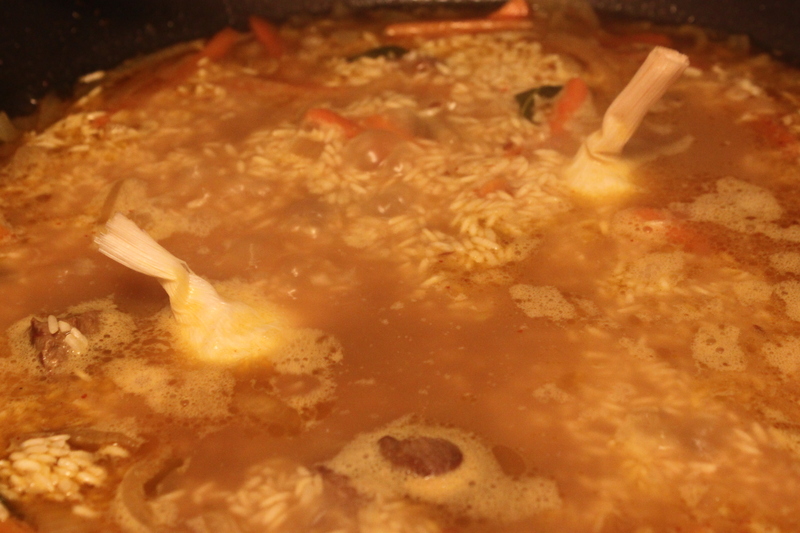 – Sprinkle rice onto the surface of the broth. Don’t stir. – Makes 2 holes and add in 2 garlic bulbs in a way that you can see only the top of the garlics, other parts of them are submerged into the stock. – Use medium heat for 15 minutes to cook, covered. Then reduce to low – medium heat for 5 minutes. In total, 20 minutes is required to cook this dish. – The Plov is cooked through and the rice still retains its shape. The upper layer of the rice is firmer than the lower’s. – Press the garlic bulb and stir well with rice and other ingredients. Serve warm. Each portion of Plov should have every ingredients on it. 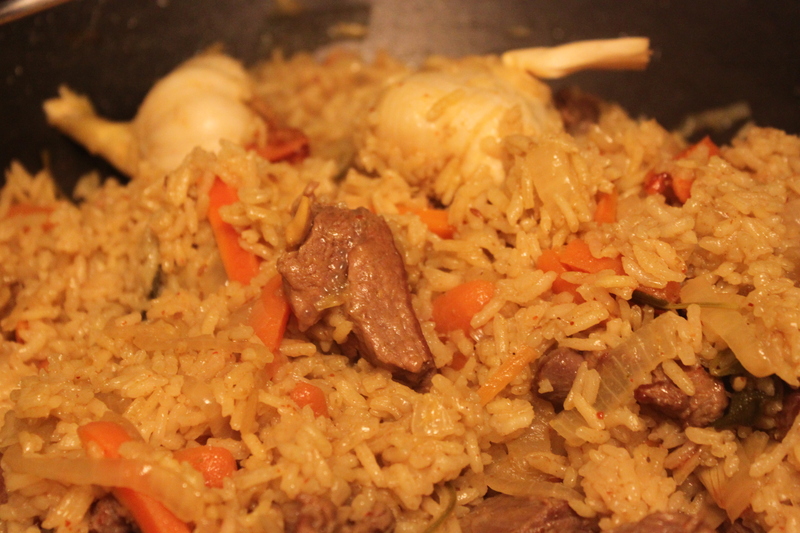 This entry was posted in casserole, Uzbekistan and tagged lamb, lamb rice, pilaf, Uzbek plov. Bookmark the permalink.